TL/DR edit: There is now a big infographic that summarizes the whole thing at the end of this post. The configuration of the standalone Wheel of Fortune game certainly added some wrinkles into the Carcassonne universe, and when Big Box 5 came along things became significantly more confusing (and for some, frustrating). CAR 7.4 offers a fair amount of helpful information, but the next update could benefit from additional clarity in the details, more tile distribution images, and a correction or two. The following is the result of my research, which included a painstaking tile-by-tile comparison of these two modified tile bases (every tile detail including gameplay, watermarks, and even the decorative buildings). I welcome all feedback on whether this visual approach is helpful or not. If it is, I will likely use explanations and/or graphics along these lines in the planned CAR 7.5 update (though perhaps not with all the detail presented here!). Understanding the configuration differences between the standalone Wheel of Fortune game and the corresponding features in Big Box 5 can be daunting. Comments and discussions in various venues make reference to a variety of overlapping tile groups with counts of 1, 3, 9, 10, 13, 16, 18, 19, 72, 84, and 85, and fitting those comments into a cohesive understanding of the actual, physical tiles can be a challenge. And of course there are also the various "why did they do that?" questions. The following attempts to bring clarity by taking a step-by-step visual tour through the (presumed) design goals that brought us to where we are. The starting tile was replaced with a copy of the same CRFR face, but on a normal back. The 9 removed draw tiles were replaced by similar-yet-different ones from various early expansion sets, as shown below. Then, wheel symbols in three denominations were added to 19 tiles. As seen above, one wheel was added to one of the replacements (an RRRR tile that I like to call the "tennis ball"). 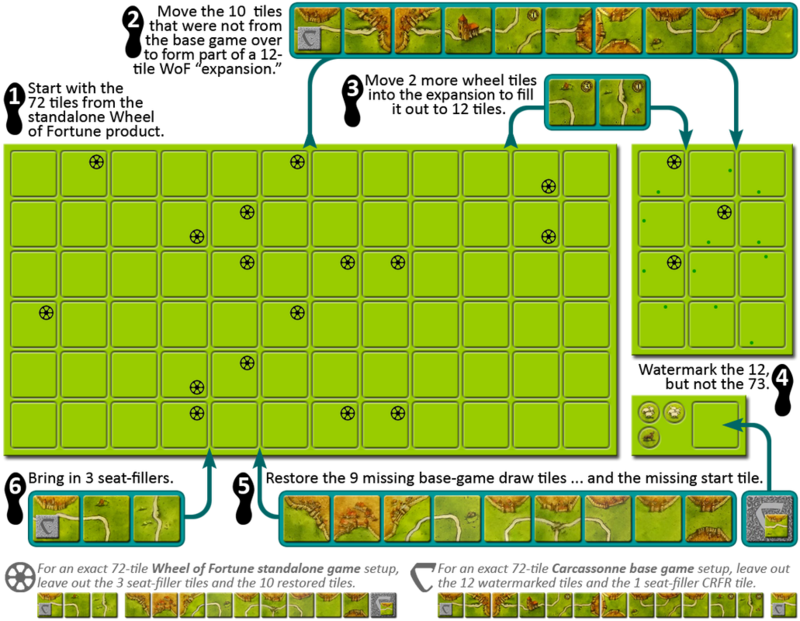 The other 18 wheels were all added to normal tile configurations from the original base game. All of these except two are exclusively road tiles; an image of all 19 appears near the end of this post. With these 10-for-10 substitutions, the standalone Wheel of Fortune set had a tile count of 72, just like base Carcassonne. However, all 72 in this set are draw tiles (instead of 71) due to the conversion of the start tile's back from dark to light. All 72 tiles are watermarked with a tiny wheel icon. Carcassonne base game approximation (73 tiles): Use all non-watermarked base-game tiles; ignore the wheel symbols that appear on 16 of them. Omit the 12 watermarked tiles. There will be one extra CRFR tile compared to a true base game. WoF standalone game approximation (84 tiles): Omit the starting tile; use the 72 base-game draw tiles and add the 12 watermarked tiles, plus the WoF starting tableau. There will be 12 extra base-game tiles compared to a true standalone WoF game. This hybrid design can make the included tile mix hard to understand, for multiple reasons. First, 85 is a very unusual number of core tiles. Second, all possible combinations of wheel symbols and watermarks exist: just a symbol, just a watermark, both, and neither. Third, players who are aware that WoF is supposed to have 19 wheel symbols are confused by the facts that the BB5 "WoF expansion" contains only 12 tiles and only three of those have wheel symbols, with the other 16 sprinkled among the base tiles. Fourth, whichever setup the players choose, there will be too many tiles (by either 1 or 12) which can make it seem like we're doing it wrong, or at least lead to brain-burn trying to explain the tile count differences. It all feels pretty odd or even vexing at first, but hopefully it starts to make more sense when we step through the (apparent) design rationale. To support normal base-game play, BB5 needed to restore the 10 original tiles that the standalone game removed, including the start tile. This is pretty straightforward, and these tiles are non-watermarked like the rest of the normal base-game tiles. All of the tiles that are shared in common between the WoF standalone product and the original Carcassonne base game were ported over to BB5, but in the process most of them lost their WoF watermarks. This was done so that the few watermarks that remain could be used as an easy way to switch in and out of "WoF mode." To support full Wheel of Fortune play, BB5 also needed to keep the 10 newer tiles that had been swapped into the WoF standalone game but were not shared by the normal Carcassonne base game. Unlike most of the other tiles ported from standalone, these 10 all kept their watermarks (including the CRFR tile that backflipped from starting tile to draw tile). Remaining true to the standalone game, in this group only the "tennis ball" has a wheel symbol; the other 18 wheels are still found on the same base-game "vanilla" tiles that were upgraded with wheels in the standalone product. Thus, our initial expectation that BB5's 12 "WoF Expansion" tiles would be chock-full of wheel symbols gives way to the reality that this group is instead characterized by non-base-game tiles that map directly back to the WoF standalone product. It's the add-on group needed to take "base with most of the wheels" and upgrade it so that it can provide the full WoF standalone experience, albeit with a dozen extra tiles. And those extra tiles come from two sources. First, of course, there are the 9 draw tiles in the "restored" group that have light backs (the 10th one is the unused starting tile). These don't have watermarks of any kind, and thus BB5 doesn't worry about trying to separate them out. They're just "extra" when you play in WoF mode. Second, there are a few more tiles thrown in to fill out the punchboard sheets. 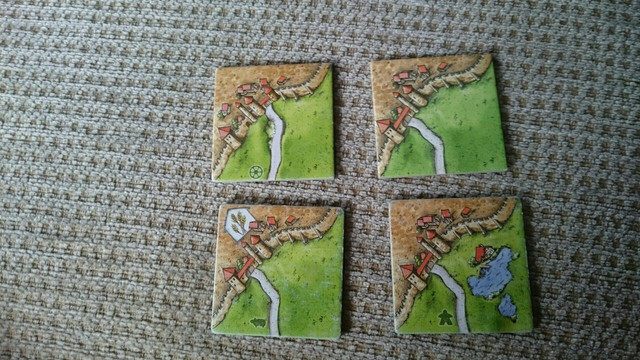 Normally Carcassonne tiles are printed in multiples of 6 or 12, and BB5 primarily is no exception. Because the dual-mode approach required 10 more tiles than normal, we might think there's room for two more in an added 12-tile section, and we'd be right about that. However, they decided to give the lone CRFR starting tile its own special place of honor (near the sheep and wolf tokens), so that also opens up one more slot among the 72 core tiles. Thus there's actually room for three extra tiles in the product configuration, although their positions on the sheets add another little complexity to the story. The final three core tiles added are about as vanilla as they can be. Basically just three relatively boring "bonus tiles" to fill out the punchboard. "But wait a minute," you say. "Where are the wheels? And the watermarks?" Those are good questions, since the final group of 12 tiles we're discussing clearly has watermarks on all three tiles that look like these, and wheel symbols on the two plain roads. The explanation is that there was a little switcheroo on the placements. Then, two of the road tiles with wheels being ported over from standalone WoF, in the same shapes as the two new ones being added, were moved out of the 72-tile section and into the 12-tile "WoF expansion" section, where they got their lost watermarks restored and filled the last two spots there. Accordingly, the two added plain roads filled those two vacancies in the 72-tile section. Thus, if you compare BB5 to the WoF standalone game, you will find that these three tiles are indeed extras. They just quietly sneaked into the three vacancies in the 72-tile group, like stand-ins or seat fillers. And that's how we arrive at the puzzling 12-tile "Wheel of Fortune expansion" in Big Box 5. As for why it was done this way, I would speculate that KJW/HiG were aware that an "expansion" that had only one wheel symbol would seem really odd to players. (Was that single wheel a mistake? An extra wheel relative to the standalone game?) Perhaps they realized they had the opportunity to position a couple more wheels in that group without wrecking the dual-mode strategy of BB5, and did so to make the "expansion" seem just a little less weird. One consequence of all this is, if you decide you want to play a true, tile-for-tile representation of standalone Wheel of Fortune, then in addition to ignoring the starting tile you also need to remove 12 extra non-watermarked, non-wheel tiles from the game. This group of 13 tiles documents the exact difference between the 72 tiles in standalone WoF and the 85 in Big Box 5. It's too bad they didn't make things easy for players who wish to omit these 13 tiles by watermarking them with a "C" or something. Then it would have been simple to play in just about any configuration. You could start with all the non-watermarked tiles, then add the wheel watermarks if you want to play WoF, or add the "C" watermarks if you want to play base Carcassonne. Both editions of Wheel of Fortune have the same 19 wheel-symbol tiles in the same gameplay configurations. Only the watermarks differ. So it is possible to summarize all of this choreography into one big Arthur Murray dance card? Let's give it a try. I hope this helps clear things up for anyone who, like me, was still struggling to wrap their brain around these confusing hybrid products. This is an awesome article up to this point I could never understand this incredibly counter-intuitive tile configuration. Thank you! Great amount of research you have done! I never realised that different variations could be missing the watermark (I would have assumed all expansions would include one or keep those which appear on their older counterpart. I have always been baffled as to why GQ11 does also seem to have a watermark). Merit for writing up what I have been wondering about since buying bb5 for this reason and being quite disappointed. It is of some annoyance that I am still looking for a WoF expansion to be able to play as you describe it in, original WoF without any hassle. The fact that a base carc also features ugly numbers that are not part of what I am playing is also annoying. Maybe I shouldn´t buy kathars, what would I do next? Merit from me too. For some reason I thought the different tiles weren't easily available in other expansions. Now that I see this, I don't feel so bad about not having WOF. In fact, I don't think I will get it even if I find it used and cheap. Thanks! One thing I was missing was a big summary infographic for the whole thing, so I've added that today to the end of the original post, under a new section with a silly heading. I'll also attach it here as a thumbnail. The CCFR tile you stated that comes from the Games Quarterly instead of the Inns&Cathedrals. I was curious about it, and saw that the one in I&C has a lake on it, and GQ doesn't, so it would make sense that its more similar to GQ than I&C. In all the expansions I was able to find 1 more tile with this configuration, in the Traders&Builders expansion, with a Grain token on it. As seen, the road goes up a little bit more in the WoF tile. There is also one more little house in the city, but even my OCD doesn't go as far as to state this as a completely new configuration. Huh, that's interesting. When I did my research I only paid attention to the gameplay configuration, not the details of the actual artwork. But as you've rightly pointed out, the tile is definitely not copied from GQ11 after all. (It has the same gameplay value, but not the same artwork.) The position of the watermark notwithstanding, it appears to be a mirror image of one of the other tiles that was copied from I&C. That is, it's an I&C tile image that was flipped to reverse its configuration. So, in that light, I'd say it was correct (or at least reasonable) for the CAR 7.4 to call it an I&C tile after all; but in any case I was clearly wrong to attribute it to GQ11. Good sleuthing, and thanks for the correction. I got the dutch version of the stand-alone in yesterday, and the rulebook states that there are 72 tiles, one of them would have a black back as a starting tile. In the tile configuration this is not shown. The starting tile is similar to 3 other regular tiles. In the normal base game this is sometimes depicted as 4x of this tile with an asterix and further down a legend explaining that one of them is the starting tile. Easy way to find out is, I suppose, to check the tile configuration if it says 3x or 4x of the CRFR (city-road-forest-road) tile. @Just a Bill: When the completion of the work on the ver. 7.5 of CAR is expected? Sorry for my straight question. There is no expected date, sorry; I have no idea how long it's going to take me to get through all the material. There are three parts to this, all of nontrivial size: the CAR 7.4 as the starting point; Obervet's unpublished post-7.4 notes; and new developments from HiG and ZMG. If I had to make a guess, I would say it will at least be well into 2018 before I can even consider having something publishable. I'm not just "tacking on" new information, but actually considering which existing parts could benefit from updates. And, of course, this is not my real job or even my only hobby project; I manage another complex rules document (115,000+ words at last count) for Cosmic Encounter, and I do design work for a few games. I guess you could say the "blessing and the curse" of my involvement is that I'm pretty thorough, but also quite slow. How many rules have changed from the expansions of the old edition to the new one? All this and more, in the CAR 7.5! I'd say the CAR document is in good hands with involvement of people like yourself who are sticklers for rules and the way they sometimes affect each other. I will be excited to see the updated CAR once it's available.